It's really late tonight as I'm writing this, so I apologize in advance for any nonsensical musings about garlic scapes and kohlrabi. I'm trying my best to get the blog posted on Wednesday evenings and hopefully - coming soon to an email near you - to send the blog via email at the same time as your invoice based on the popular response from the survey. So in my effort to get this to you on Wednesday night, after getting through regular work and family commitments, the blog is getting my full attention as last item to get done very late in the evening. I am so excited to get garlic scapes this week, maybe a little overly excited. I love scapes, I discovered them only last year and have been asking the last 3 weeks at the Ottawa Farmers Market, "when will you have scapes?" And now we do, I bought a huge bag at the market and we are getting more in our veggie box this week. You may have even had some scapes in your green garlic last week - they are the long firm bean like stems that come out from the green leaves of the garlic. Scapes have a milder taste than garlic and are very versatile. They can be sauteed, steamed, chopped fine, stir fried, grilled, put in sauces or pureed into pesto. You could saute them with this week's green beans, or make a pasta with the scapes and spinach. I have so many plans for my scapes, but I'm most excited about making pesto from them. I came across a recipe for Double Garlic Soup that could make use of last week's green garlic (if you have any left) and this week's scapes, and also this dip recipe from 2 Sisters Garlic in Indiana. In a food processor, process garlic scapes with lemon juice, salt and pepper until finely chopped. Add cannellini beans and process to a rough purée. With motor running, slowly drizzle olive oil through feed tube and process until fairly smooth. Pulse in 2 or 3 tablespoons water, or more, until mixture is the consistency of a dip. Add more salt, pepper and/or lemon juice, if desired. Spread out dip on a plate, drizzle with olive oil, and sprinkle with more salt. Serve with bread, tortilla chips, etc. It may be sounding like it, but this is not late night craziness. I am also excited to get kohlrabi this week. Not quite as excited as I am about the scapes, but a little oddly excited about kohlrabi. I had it for the first time at some point last year in our veggie box and my girls ate it all up - just sliced - they thought it was apple. It was delicious. At some point this spring, my mother told me that my grandmother used to grow kohlrabi all the time in her garden because it grew so easily, and so my daughter and I planted some this spring in front of our tomatoes. I only have 4 plants, and the bunnies have eaten the leaves off three of them, so they are a bit sad looking but the bulbs are growing and should be ready soon. 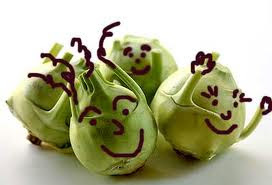 I read a few different things about kohlrabi and my favorite description is "little sputnik like vegetables." The bulbs should trimmed of leaves and then stored in a plastic bag in the refrigerator. The small ones can be eaten as is with the skin, larger ones need the tough skin peeled off. Most of what I read recommends eating kohlrabi raw and I completely agree. Have it chopped as a snack, cubed, or shredded into a salad such as Kohlrabi Apple Slaw with Creamy Dressing. If the leaves are still on the "sputnik" then they can be sliced into a salad, that is if the bunnies haven't eaten all of them off the plants (not that I'm bitter or anything). Kohlrabi is also good cooked, slice or dice it and wrap in tinfoil to grill on the BBQ or cook it according to this recipe for Kohlrabi Ham Bake. Okay, now I am into late night craziness as evidenced by the photo, so just one last thing for this week's box. My favorite mom website is SavvyMom.ca. The most recent installment of One Ingredient, Four Ways, on their EatSavvy section is about cucumbers, which for me is perfect timing. Number one - we have cucumbers in the box this week, and number two - we are entertaining at the cottage this weekend (where the kids will outnumber the adults, hence sliders instead of burgers) so I can try the Lamb Sliders with Cucumber and Feta Sauce. The other cucumber recipes from EatSavvy are Homemade Tzaziki, Roasted Salmon with Fresh Cucumber Salsa, and Chilled Cucumber Soup. Under the wire, blog finished and posted on Wednesday evening, a first for me, like growing kohlrabi and making scape pesto. POST NOTE - Friday, June 22, 2012 - just got my box and Tasha wanted everyone to know - try to eat your green beans soon, ASAP if you can.